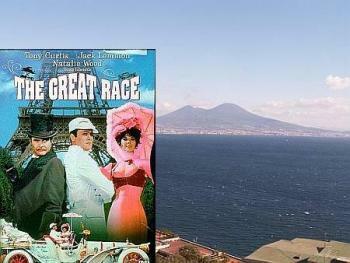 Movie buffs may recall the delightful 1965 Blake Edwards movie, The Great Race. It starred Tony Curtis, Jack Lemmon, and Natalie Wood involved in an auto race around the world. Many may not know, however, that the film was based on a real event that took place in 1908. There are two glaring bits of poetic license in the film: (1) in spite of the original plan to do so, the real race cars did NOT drive through Alaska and over the ice-bound Bering Straits to Siberia (the way they do in the film); and (2) none of the participants looked anything like Natalie Wood! Other than that, the real race was just as good as the film. An excellent account of the race comes from Antonio Scarfoglio (1886-1969), a journalist for il Mattino, the Neapolitan daily newspaper. Antonio was one of the three drivers of the Italian team that entered the New York-to-Paris car race. He wired back 50 dispatches to his paper as the race progressed and then published them in book form in 1910: Il giro del mondo in automobile (Around the World by Automobile). The Italian car, a Zust, was one of six starters and one of the three vehicles that actually finished the race. ...the US entry, the Thomas Flyer ...sleek and low like a dolphin... the German Protos, short and squat on its rough wheels...the three French cars: the pyramid-like De Dion Bouton and the fragile and small Motobloc and the Sizaire...as if all the manufacturers have built bits and pieces of the national psyche into their cars ...including our own Italian Zust, slim and nervous. In the Zust with Scarfoglio were the main driver, Giulio Sirtori, and the mechanic, Heinrich Haaga. Scarfoglio wired the Mattino that he expected "to reach Paris on July 15." That estimate was a gross miscalculation of the difficult journey ahead. (The roads were primitive; the first coast-to-coast road in the US, the Lincoln Highway, would not open until 1913.) Driving north from New York City, all of the cars have problems in the snow. In spite of the problems, Scarfoglio's car covers 350 km in the first three days; one car, however, the Sizaire, has already dropped out. As they head toward Chicago, the cars are still within hours of one another and often change the lead. Approaching Chicago, the temperatures drop to -26° C. (-13 F.), and all the cars at some point have to be towed by animals. Scarfoglio leaves Chicago on March 1. The cars start to spread out. The Thomas Flyer is leading as they head into the plains. Another French car, the Motobloc, gives up the ghost. Now there are four. In the month of March in Nebraska, all the cars at some point "ride the rails". That is, while the rules prohibit loading your car onto a train from one point to another, nothing says you can't get up there on the track and straddle one rail, one wheel on the outside dirt and the other on the railroad ties between the tracks. It's bumpy, but it's better than no road at all. In late March, the Italian team has to fight off a wolf pack in Wyoming and by the end of March are in Goldfield, Nevada; they head for Los Angeles, which they reach in the first week of April after a six-week trip across the US (three times longer than planned). By this time, Scarfoglio's Zust, the German car and the one remaining French car are days behind the Thomas Flyer. They race for San Francisco where George Schuster, the American driver, is already embarking for Valdez, Alaska. On April 13, Scarfoglio writes that the ice in Alaska has begun to melt and that crossing the Bering Straits would be impossible. Indeed, the Thomas Flyer has to turn back from Valdez, Alaska because of the thaw. All of the four remaining cars leave for Yokohama by ship and cross to the west coast of Japan on roads that are so steep and full of tight hair-pin cutbacks that the cars have to be picked up and carried through each turn. They cross to Vladivostok by a two-day ferry trip. The German team, led by Lt. Col. Hans Koeppen of the 15th Prussian Infantry, is the first to land at the Russian port. Then, the Italian and French cars disembark from a second ship. A few days later, the Thomas Flyer, delayed because of the Alaska detour, shows up. Suddenly it's a race again. In Vladivostok, the remaining French car drops out, and the main Italian driver Sirtori is unable to continue. The Flyer and the Protos leave the Russian port on May 21 in the driving rain. The German car had picked up a 15-day penalty for having used a train from Ogden, Utah to Seattle in the United States. Rather than spot the other cars the 15 days in Vladisvostok by waiting out the penalty, the Protos leaves Vladivostok together with the American car; the German driver says that even if he doesn't "win" the race, he wants to cross the finish line first (which he does, many weeks later, in Paris, four days ahead of the Flyer). The Italian car, now with only Scarfolgio and the mechanic aboard, waits for a couple of weeks for permission from the home office to continue. The plan of all three cars: make for the Manchurian railway and straddle a rail, as they did in the Western US, or drive on the access roads still in use by construction crews (the Trans-Siberian railway would not be completed until 1913). The route: through Manchuria and Mongolia and on to Irkutsk, across Lake Baikal, on to Novosibirsk, Omsk, Yekaterinburg, across the Urals into European Russia, on to Moscow, St. Petersburg, along the Baltic into Poland, then Germany and home to France. From Vladivostok to St. Petersburg is about 6,000 miles as the crow flies. Crows, however, are well above the rain and mud of Siberian spring, bandits, very wild animals, and a few close calls with the Trans-Siberian train. And crows never have to send out for gasoline. The three cars are now headed for Lake Baikal, beyond which they start picking up decent roads, helped along by better weather. The Zust is welcomed in Moscow by the Italian ambassador to Russia. Near St. Petersburg, the Italian car frightens a horse drawing a cart; the animal bolts and throws a young boy riding in the cart to the ground. The child dies and Scarfoglio and Haaga are in a Russian jail for three days before the authorities decide that they are not responsible. They are sent on their way, are given a hearty welcome in Berlin, and on September 17, six weeks behind the other two cars, they roll into Paris after seven months. Officially, the American Flyer finishes first, the German Protos second, the Italian Zust third. Antonio Scarfoglio lived through an age of great change. When he was born, the steam engine was king and powered flight a fantasy, but a few days before he died in 1969, his old newspaper, il Mattino, was running photos of Armstrong and Aldrin rehearsing the first moon landing. Amid all that, who knows if, towards the end, Scarfoglio didn't harbor whimsical thoughts about the modern world, maybe something along the lines of, "Yes, going to the moon is some pretty fine technology and, no doubt, a great adventure...but you know something?...I drove a car around the world in 1908."